Is driving 10mph over okay? 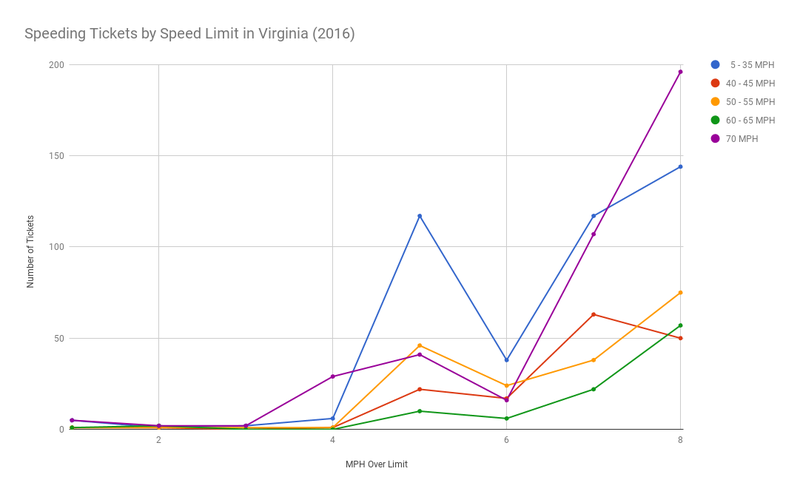 Once again, a thread on the Norfolk subreddit has prompted a look into speeding charges in Virginia’s court data. In my story from last year, I identified the counties and cities where drivers are most likely to be ticketed for speeding. Now it’s time to answer the more popular question: how far over the speed limit is it “safe” to drive? Once again, the data back up the conventional wisdom. The odds of getting a ticket for going 8 mph over — regardless of the speed limit — are virtually zero and, in most cases, it’s safe to go up to 11 mph over. On the other side of the coin, driving 15 mph over the speed limit is regularly ticketed in every speed zone. The exception to the rule, as many Reddit commenters pointed out, is the 70 mph zone. In Virginia, driving in excess of 80 mph is reckless driving, an offense that can carry jail time, despite regular attempts by the legislature to amend the law (2016, 2017, 2018). An explanation for the spike at the 70mph mark might be that officers sometimes use their discretion to drop the charge to “80 in a 70” in order to issue less serious speeding tickets to drivers who are technically driving recklessly. Driving between 12 and 14 mph over the speed limit is always a risk, but it surprisingly seems to be less commonly ticketed in medium speed zones (40–55 mph). While relatively rare, tickets are sometimes given for driving just over the speed limit. A closer look at this part of the graph shows that this occurs most often in the slowest speed zones, as you might expect. Where should you be particularly careful? 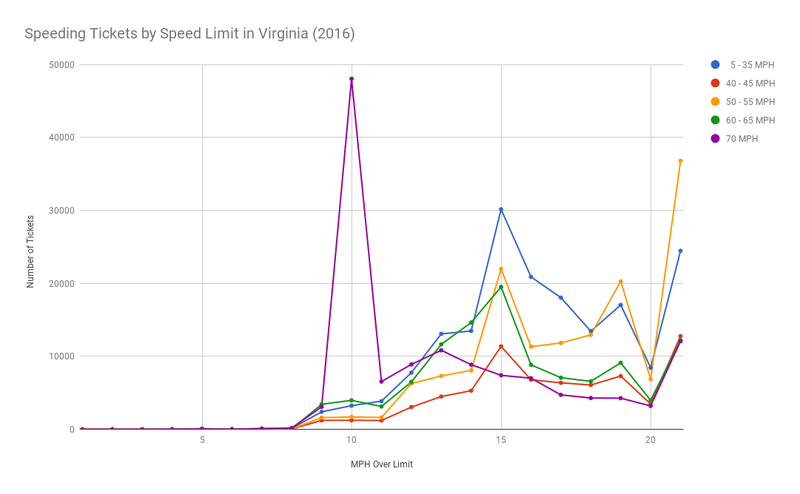 As in the last story, I used VDOT’s daily vehicle miles traveled data in order to weight the number of speeding cases per county. I then computed the number of standard deviations from the mean for every mph over the limit. Since tickets are rarely given for going just over the speed limit and commonly given for going 15 mph over, I’ll focus on the 9–14 mph range. I’ll show the data for each speed zone individually and limit the lists to the localities that average more than one standard deviation above the mean among the six buckets. In short, these are the places a driver is most likely to be ticketed for driving 9–14 mph over the speed limit. Buena Vista is the worst in this zone, followed by Bristol and Emporia. In Emporia, tickets for going 10 over in a 40 or 45 MPH zone are issued at an insanely high rate relative to all other localities. It’s dangerous to speed in all of these places, but they all pale in comparison to Emporia. This zone has the most localities that issue tickets well above the mean. Highland, Brunswick, and Bath top the list. Emporia tops the list again, issuing tickets at an astronomically higher rate than other localities — even more significant than the difference in the 40–45 mph zone. Southampton is a distant second. Since speeding in excess of 80 mph is a more serious offense, I treated this zone differently. Here are the places a driver is most likely to be ticketed for driving 5–9 mph over the 70 mph. As a rule, stick to the speed limit on the interstate in Southwest Virginia. And although I didn’t include a map, I also looked at ticketing rates for going 10–14 mph over in this zone and found that Hopewell and Emporia topped the list. Finally, I looked at the difference between the frequency of 80 mph tickets to 81 mph tickets in an effort to capture where officers are most (and least) likely to downgrade a ticket from reckless driving to speeding. Emporia gives an above average number of both 80 and 81 tickets, so it’s hard to draw conclusions. Smyth, Washington, Wythe, and Alleghany all give an above average number of 80 tickets, but a below average number of 81 tickets, suggesting officers in those counties are likely to downgrade a reckless driving ticket. At the bottom of the list is Hopewell, where officers seem more than willing to hand out reckless driving tickets. Don’t count on getting a break here. I modified the code base from my first story and pushed all the changes to Github. If you want to read more about my methods, go check out that first story. Links to all the data I used should be readily available between the two stories, but if I missed anything, let me know on twitter. For this story, my python script aggregated my data, but I did a lot of the analysis and created graphs using Google Sheets. The spreadsheet I created is also in the Github repo. The maps were again generated using D3.js. Thanks to Jonah Adkins for his mapping advice. Also thanks to my wife, Tracy, for her perspective as a traffic engineer and her help in editing this story.